The murder of Rising Kashmir’s Shujaat Bukhari has shocked and stunned all those associated with him, as well as those that keep a close eye on the political situation within the troubled region. 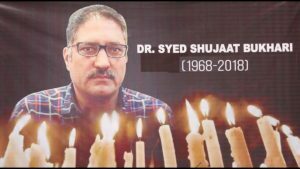 Known to be a gentleman and a good soul, Shujaat Bukhari’s murder is hard to comprehend. A hardworking journalist that was just doing his job. A man who had a genuine concern for his Motherland. Another light has extinguished in the beautiful yet bloodied valley. We are yet to know the full details of what happened, other than the fact that he was attacked by gunmen as he left his office. It was a cruel and cowardly act on a defenceless man. One hopes that the perpetrators will be brought to justice. Sadly, nothing will bring back another loss of innocent life. The void that has been created with Shujaat Bhukari’s murder can never be filled. And this only creates more obstacles for other brave journalists that work under extremely difficult circumstances to report on the ground realities. The job of a journalist is never easy. They are in a constant battle, a struggle to bring the truth out of the darkness and into the light for all to see. But in a place like Kashmir, it is never easy. In a place where bloodshed has become the norm, a journalist does not know whether his or her story shall be their last. There are multiple threats. But they are brushed aside so that they can do their job. Who isn’t afraid of what could happen? It is human nature. But these brave journalists conquer all fears so that they can be a voice to all those that are unheard. We can only hope and pray that the truth surrounding Shujaat Bukharii’s tragic death shall be uncovered soon. His family deserves to know. But it is also interesting to note the timing of this attack. On the very same day, the United Nations report on Kashmir was released, and as expected, Shujaat Bukhari had been closely following it. He had been active on social media, tweeting over latest developments. And within hours, Shujaat Bhukari was shot dead. Whether there is a link between the two – only time will tell. But one cannot help but question the timing of this cowardly act. The UN released its first ever report on alleged rights violations. The statement by the Human Rights Chief referred to alleged sites of mass graves in the Kashmir Valley and Jammu region, which needed to be investigated. According to the 49-page report, Indian Security Forces have used excessive force in Kashmir and killed and wounded numerous civilians since 2016. As expected, India has rejected the report. But Human Rights activists have welcomed the report and labelled it as a small step in the right direction. Many are seeing it as a small window of opportunity to hold India accountable for the gross Human Rights violations that have been carried out against the people of Kashmir. This should have been marked as a significant day for the people of Kashmir. Instead, the people mourned the death of one of their own. Voices that speak up for the people of Kashmir are being silenced, and this is deeply damaging for the Kashmir cause. Voices like Shujaat Bukhari spoke of the true picture. His words carried merit. Kashmiris need their own people to represent them, otherwise the world hears of Kashmir through Indian journalists, that push forward New Delhi’s narrative. And that is detrimental to the Kashmir cause. Shujaat Bukhari paid the price of speaking the truth. But this will not deter the other brave journalists within Kashmir. Kashmiris know how to stare at difficult conditions right in the face. They bury loved ones and carry on with their lives. It is a sad fact, but their hearts have become hardened by all of this. The only real worry is that how many more will have to suffer the same fate as Shujaat Bukhari. These people fearless carry out their duties. But how many more families will have their lives destroyed forever? Shujaat Bukhari’s murder will not stop others from continuing with their mission. But it is frightening to think that people who seek the truth are being deliberately targeted.